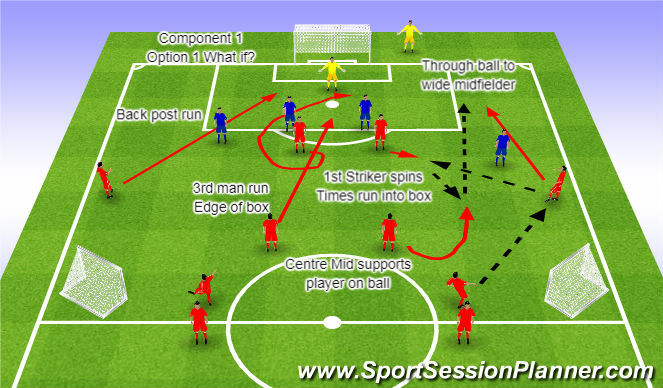 Session designed to work on midfield support in a 4-4-2 formation. Attacking team will shoot into the large goal and if defenders win possession they look to play into small sided goals. Pattern of play - Option 1 What if? 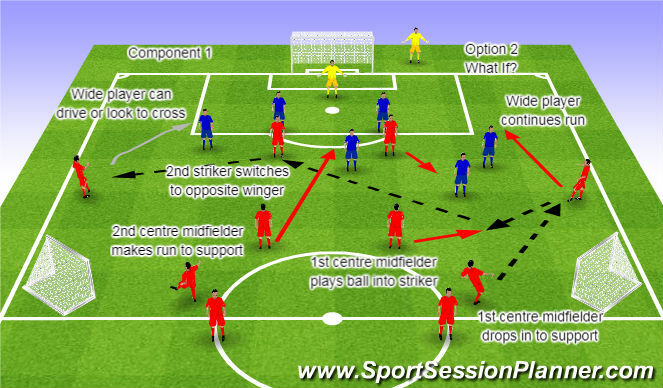 Pattern of play - Option 2 What if? 16 players - 14 outfield plus 2 gk. 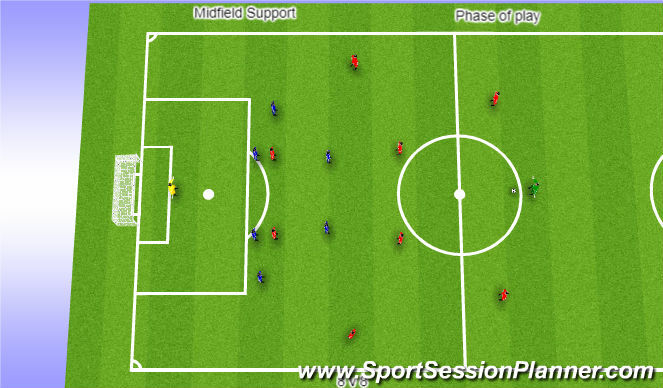 3 zones - defensive, middle and attacking 3rd. Wide areas identified as well. 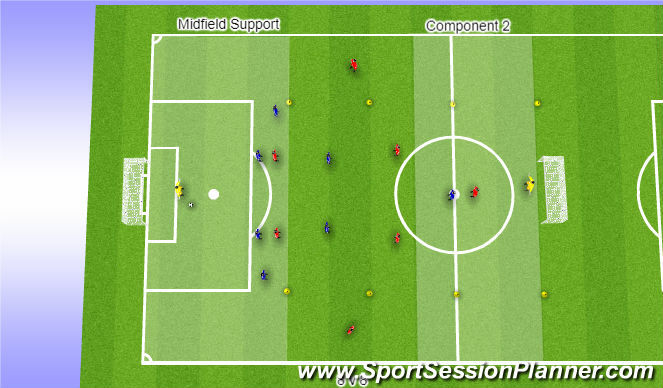 Midfield support conditioned game (component 2). 3 zoned game 8v8 working into the large goals. Blues shaped up in a 4-2-1 formation and reds set up in a 1-4-2 formation. Players can advance between the 3 zones but not drop back further than their original zone. 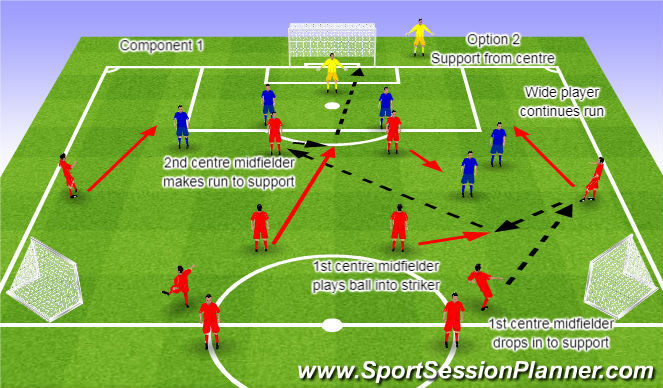 (For example the midfielder can go and support the striker but can&apos;t drop back in to cover the defender). 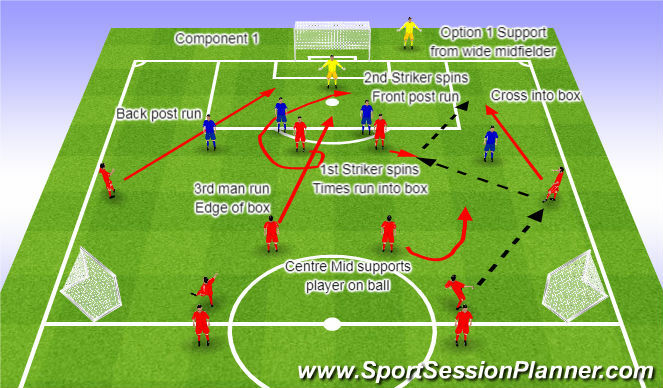 Conditions are then removed, defending players can go into the wide areas to defend crosses and press the ball. Also zones are removed and is now a free game. Players are looking to use coaching points learned in component 1. Working in just over half a pitch using full width. Free play phase of play. Coach is looking for times in the game when team don&apos;t do what was worked on in component 1. The coach is then looking to show the team the solution and what could have been done in that situation then let the play go again and hopefully the team will perform better in that situation. The reds will be shooting into the large 11 a side goal. If the blues win the ball they look to find the green feeder for a goal. Each time the ball goes behind for a goal kick the play will re start from the feeder.